Ralph Fiennes, a guest of the Cairo International Film Festival (CIFF) this year, is the villain who captured our hearts for all the wrong reasons. We know him as Lord Voldermort in The Harry Potter series, Nazi Criminal Amon Goth in Schindler's List, psychopath killer Francis Dolaryhde in The Red Dragon. These are just a few of his many roles where he performed skillfully and managed to win prizes, award nominations and the hearts of his audience while embodying characters that we love to hate. 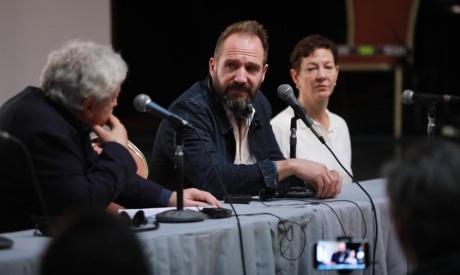 In an open discussion at CIFF, Fiennes spoke about how the Cairo scenes of his most memorable role — Count Laszlo De Almassy in the The English Patient — were shot in Morocco and Italy. As if he felt the audience's silent request, he said that shooting a film in Cairo or Egypt is now on his agenda. Critic Nina Roth, who moderated the conversation, highlighted the fact The Red Dragon and Maid in Manhattan were both released in 2002, yet the roles he played in both movies could not be more different. In the first, he is a psycho killer, in the second, a prince charming. His response referred to his formative years in the British National Theatre, which proved invaluable in his training as an actor. “It is not uncommon to play three or four roles in the same season, so I used to play a role while preparing for another in the next play. That is the backbone of any actor’s training,” he explained. Fiennes was chosen as a guest of CIFF's 40th edition for two reasons: to honour him with the Faten Hamama Award, and to show his newest film, The White Crow, which he directed and also played in the role of Alexander Pushkin, the famous Russian ballet coach. He took a long time to prepare for the movie that is based on the true story of the defection of Soviet ballet dancer Rudolph Nureyev in 1961. He resurrected the ballet dancer's legacy of looking for freedom and not settling for less. “His will power, determination and force to pursue what he saw was right was an inspiration for me," he said. The film focuses on Nureyev's difficult decision to leave his homeland, which nurtured his skill, and boosted his talent and fame; yet his restless soul and curiosity pushed him to explore the world beyond, and adopt a different way of life in search for freedom. As an actor, Fiennes has worked with many great directors and he gave credit to Steven Spielberg in guiding him during the shooting of Schindler’s List to capture the human side of the Nazi officer, a challenge at which he excelled. Another notable director he collaborated with is the Hollywood icon Robert Redford in The Quiz Show. Redford asked him to come to New York for an audition for his part while he was shooting Schindler’s List in Germany. Spielberg was not happy to see him leave the shooting to test for another movie. Yet he accepted, and Fiennes got both roles and shot both movies in parallel. As a director, Fiennes has made three movies, and considers his style to be a verbal one, to guide the actors to achieve his vision as he sees it. In the discussion Fiennes shared how hesitant he was at first to throw himself into directing, but he found much support that gave him the energy to see it through. But he who kisses the joy as it flies, lives in Eternity’s sun rise."